Aaron Lummus was born in 1792, the year his father, a doctor, settled in Lynn, Massachusetts. Religion and a “conversion experience” was very important to many people who lived in the early nineteenth century. 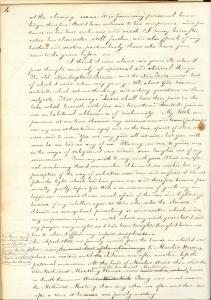 In his manuscript autobiography, Lummus recalled his first religious experiences as a boy and his conversion to Methodism as a teenager. Lummus became an itinerant Methodist minister. On the night between October 17th and 18th A.D. 1808, soon after I went to bed, I heard a strange noise in my chamber; and thought, as I was just fit for him, Satan had come to carry me off. About midnight I observed a bright light in my chamber, which shone all around. I then reasoned upon it, thus. “What is it? There is neither fire nor candle in the room: and this is not moon light, for it is a dark, stormy night! Nor can it be from a candle out of doors…”The light became brighter than that of the sun at noon, and shone in beams different from any natural light; so I concluded it must be supernatural. I then discovered a most beautiful field, at a little distance, which contained one beautiful tree. The light was so bright that the field and the tree looked like geld. Under the tree lay a young person, apparently dead. I then saw the appearance as of a dove, descending with a leaf or sprig of the tree, and dropping it to the young person. Then a larger sprig was given to the young person, and the dove ascended out of sight. As the last sprig descended to the youth, an ugly looking fowl, covered with black spots, came from a different direction, and tried to catch away the last sprig, but he could not get it away, and presently flew off the way he came. The whole scene then vanished out of sight.My load of distress was now gone, but I knew not why. In the morning I kneeled down to ask for mercy as I had done, but immediately found myself praising God for his love and goodness…Afterwards, I told brother B.M. what had appeared to me in the preceding night…My heart was filled with a calm peace, which I never felt before; my mourning, and sorrow, and terror were fled away; light, love, joy and faith reigned in my soul. I was unspeakably happy…My health, strength and animal spirits, rapidly returned, and the next week I returned to my business…Little did I then know of the difficulties attending a christian life. I soon found that the world, the flesh, and the devil were combined against me, and that I must watch and pray continually, in order to overcome them. Mason on Self−Knowledge − A Treatise on Self−Knowledge:…and The Way to Attain It by John Mason. This book was published in many editions during the late 18th and early 19th century.